In regard to Soviet Minister of Defense Dmitriy Ustinov, he loved new toys and under Brezhnev what Dmitriy wants, Dmitriy gets. He was starry-eyed over the T-64 tank and wanted it to be the main battle tank of all Soviet forces. But the T-64 had a lousy engine and many features which had not been full thought through, so a “back-up” version, the T-72, soon eclipsed it with the Red Army. But when word leaked out in the early 1970s that the US was considering a turbine engine for their next main battle tank, he had to have one too. Kharkov (the T-64 producer) and Nizhniy Tagil (the T-72 builder) tried fitting turbines to their tanks, and while they worked, neither factory would accede to making them as they got horrible mileage. Undaunted, the Leningrad Kirov Factory under Zhosef Kotin volunteered to put a turbine in the T-64 chassis. Under chief designer Nikolay Popov, they produced Article 219 which was the prototype of the T-80. This tank was approved for service in 1976, but with such poor mileage the Red Army did not want it. A T-80A model went nowhere, and it was only with the T-80B the tank went into production in the early 1980s. This tank added a through-the-barrel ATGM capability (as Article 219R) and in 1983 was also fitted with reactive armor protection and became the T-80BV, which appeared in forward units such as the GSFG in 1985. But even this “improved” T-80 had lousy mileage – with 600 liters of extra fuel and all internal fuel it could barely reach 380 kilometers on highways. The rest of the Soviet tank fleet could do 500 kilometers without and 700 kilometers with 400 liters of extra fuel, so it was a cropper from a planning standpoint. (The generals noted it would need 2 to 2.5 times the number of fuel tankers but the MoD would not purchase them.) Back to the drawing board. The T-80U was actually approved for service in 1985, but it took until 1990 for the introduction of the new GTD-1250T engine before it could achieve the 500 kilometer range (with 400 liters of extra fuel). This tank used the newer laser-beam-rider 9M119 ATGM system, new radios, a “Buran-PA” night sight, and later mounted the newer “Kontakt-5" ERA in place of the older “Kontakt-1" used on the T-80BV. It also had a new design turret similar to that used on the diesel-powered T-80UD tank that used modern internal armor arrays and not the matrix of ceramic balls and aluminum the T-80B borrowed from the T-64 series. The Russian Army today retains about 4,000 T-80 series tanks, of which 3,000 are in storage and most of the 1,000 on active duty are a mixture of B and U types. In 1986 I was an analyst at the 3rd (US) Armor Division in Frankfurt, Germany, and after a short discussion with my boss we were able to downgrade photos and plans I drew up of the T-80B and T-80BV tanks, and using them I later built a model of each one which were used by USAREUR for training and familiarization purposes of the new tanks. As a result I have always had an attachment for the T-80s, even though they are something of an albatross for the Russian Army. 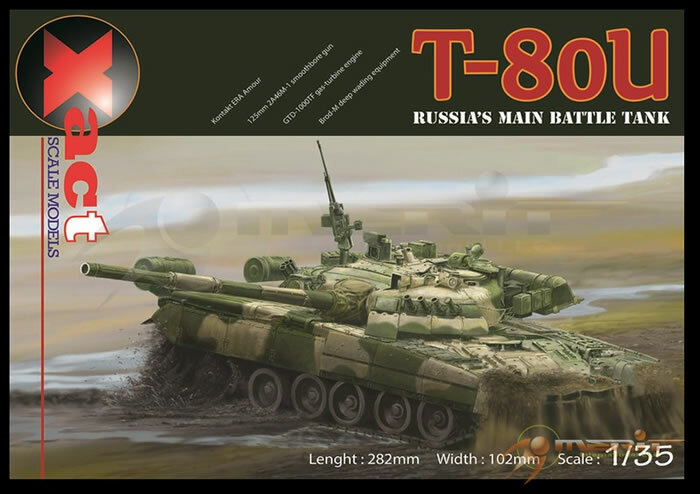 In the early 1990s DML produced kits of the T-80B, T-80BV, and T-80UD, but all of them were based on photographs and as such suffered from some severe dimensional issues. In the late 1990s SKIF in the Ukraine came out with kits of the T-80BV, T-80UDK and other subvariants, but while more accurate suffered from very poor details and some of the worst tracks ever put in a kit. Now Xact, a new company, has released a T-80U production model with “Kontakt-5" ERA and the late production underwater crossing system as its first kit. As there are apparently some shipping and supply problems yet to be solved – this kit came minus its tracks, etched brass, clear stryene and finishing directions and decals – the kits are somewhat delayed past their prospective May 2013 release date. However, enough of the components and the directions are available so a preliminary review of the kit can be made. The model is similar in some respects to the recent Zvezda T-90 kit – a deep hull pan to which the hull glacis, roof and rear plate are attached; it also comes with separate fenders. The mold quality is generally excellent and for the most part it also will permit Xact to create a T-80B series from this set of molds. There are some ejection pin marks on some parts, but most are faint and easily removed. The model does an excellent job of replicating the U version with the odd exception of the racks for the third auxiliary fuel tank being found on the engine deck – these were dropped partway through the T-80B production run from what information I have. Unlike other kits (T-64, T-72 and T-90) the scraper blade under the bow is one piece and the stiffening rods are molded in place on the hull pan. Some may argue this reduces definition, but note that the T-80U also has a long mud/dust flap (parts E-34/37) that goes across the entire bow and blocks most of the view anyway. The suspension consists of road wheel arms, separate shock absorbers, separate jounce stops, and three-piece road wheels (two wheels and a grease cap). The directions show the drivers being cemented to the final drives before assembly, but I think most modelers will attach the final drives to the hull first. As Terry Ashley recently noted, you may want to drill them out and use a styrene rod pin so you can attach them later when mounting the tracks. (As noted without any tracks I cannot assess them at this time, other than they will be one piece types; note that if you do not wish them the Russian Army has adopted what it calls the UMSh tracks or “universal” type based on T-80 style tracks, so any single link T-72/T-90 UMSh tracks should fit.) A groove is shown provided on one of the PE frets (EP per Xact) for bending the mud scrapers to shape (PE4/PE5). The fenders come with the stowage (ZIP) bins in place and the fuel tanks attached separately. As this is a late U it also represents the GTA-18 APU at the rear of the hull along with the redesigned exhaust defuser. The latter is neatly done in four parts. While the front mud guards use PE to represent the thinner rubber cowl as noted no etched brass came with the kit. Headlight guards are multi-part styrene and look good in regard to their prototypes. The turret is quite involved and takes a goodly number of the parts in the box. The “Buran” viewer comes with a clear styrene lens, a decal for its inner (protective) lining, and an etched brass backing before installation in the sight head (V5). Both commander’s and gunner’s hatches are designed to open. Like the T-90 kit, the model provides the basic faces of both the commander’s and gunners sighting equipment inside the shell. The barrel is one piece of styrene, but the one in the kit had no sink marks and was cleanly molded. The barrel end is correct for a 2A46M-1 and has the flat calibration mount on the top of the muzzle (N26). But it is quite shallow and most modelers will probably drill it out for better rendition. Xact solves the problem with the “Kontakt-5" arrays by making each one in four basic parts: top, bottom and ends, plus the rubber flaps covering the lower arrays. The Type 902A “Tucha” smoke grenade launchers are done in two parts, base and tube, for better rendition as well. Xact even has the control wiring arrays molded in suitable thickness to fit to the grenade launchers. This tank no longer uses the 1EhTs29 remote control mount for the NVST 12.7mm machine gun, so two pintle mounts are fitted to the turret. The NVST is a model unto itself, but oddly Xact placed the gun on the inside of its sprue so you will have to drill out the flash hider. The T-80U has an even more impressive snorkel array than the T-80B, dubbed “Brod-M” (brod - ford in Russian). The twin tubes are provided in their nested stowed position with the exhaust (D1/R12) at one end and the intake (R4/5/11) at the other. The trunk/combing for the intake is molded in one major piece (V6) and fitted with all of the necessary components before attaching it to the rear of the turret. The last major components to fit to the tank are the side skirts; the front pieces (H1/H2) have a blank strip in them which coincidentally sits opposite the edge of the tracks (I looked at one on a Ukranian T-80UD/T-84 tank). Note that while the kit provides for two tow cables the directions are not very clear on when and where to install them, and one only shows up in Step 46 of the directions (the other is shown being installed in Step 12 but its correct position is not shown until Step 15). As noted no finishing instructions or decals came with this pre-release kit. Overall, if the kit is as good in its final form as what is present here in the pre-release kit, this is a excellent model and will now be the kit of choice for anyone wishing to do a late model T-80.